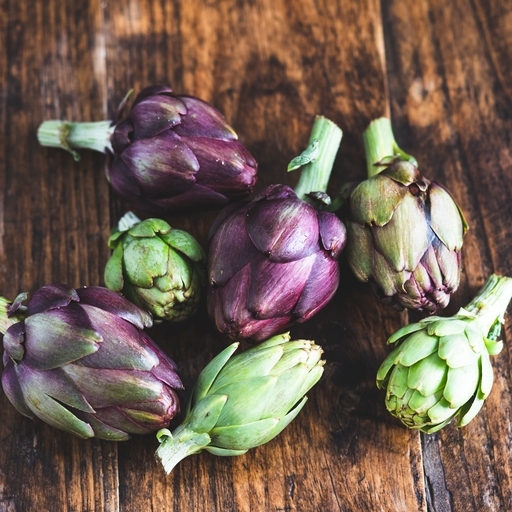 Baby globe artichokes. These are the smaller artichokes which grower further down the magnificent towering stem. Delicate and tender, they’re easier to prepare than the larger specimens with a fully-formed choke. They’re a rare treat and not round for long – so eat your fill. Cut away the top third. Strip away the outer leaves until the bottom of the leaves show light green/yellow. Any very small specimens will need fewer leaves removing, as they are more tender. Cut away the stalk and trim away any dark green on the base. Keep the small ones whole and split the larger ones into halves or quarters, depending on their size. Keep them in a bowl of acidulated water (water with a squeeze of lemon in it) until needed to avoid them discolouring. Boil whole in salted water with some lemon juice. They’re ready when tender to the tip of a knife. Good braised with garlic, white wine and stock – or browned in a pan with lots of butter and finished with a cloud of freshly chopped parsley. The Italians like to deep fry them, for eating hot and crisp with a wedge of lemon on the side. Best used as fresh as possible. Will keep well in a fridge for 4-5 days. Guy is passionate about these magnificent (and in the UK, underused) vegetables. He grows them every year on our Devon farm, from stock that he and his dad imported in a rowing boat from Brittany.